Screen Shot of Proner & Proner Ad on YouTube, 9 pm on December 1st, with YouTube noting it had been up for 11 hours. Well, there they go again. It was just this past May that I took the New York law firm of Proner & Proner to task for stepping all over New York’s attorney ethics code with regard to a local train accident, and they seem to be back at it again. Yesterday’s deadly train derailment in the Bronx occurred about 7:20 am. 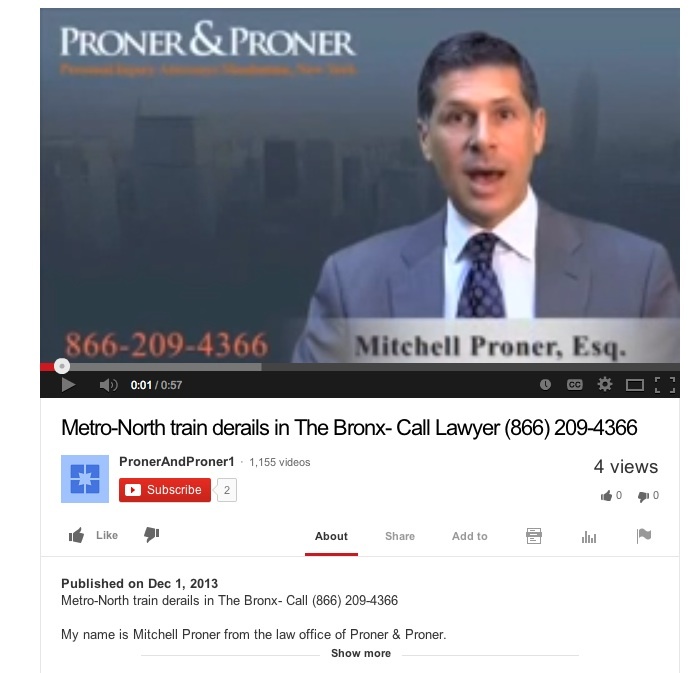 The Proner law firm ran their first ad on YouTube within hours. Rule 4.5(a) In the event of a specific incident involving potential claims for personal injury or wrongful death, no unsolicited communication shall be made to an individual injured in the incident or to a family member or legal representative of such an individual, by a lawyer or law firm, or by any associate, agent, employee or other representative of a lawyer or law firm representing actual or potential defendants or entities that may defend and/or indemnify said defendants, before the 30th day after the date of the incident, unless a filing must be made within 30 days of the incident as a legal prerequisite to the particular claim, in which case no unsolicited communication shall be made before the 15th day after the date of the incident. Rule 7.3(b) For purposes of this Rule, “solicitation” means any advertisement initiated by or on behalf of a lawyer or law firm that is directed to, or targeted at, a specific recipient or group of recipients, or their family members or legal representatives, the primary purpose of which is the retention of the lawyer or law firm, and a significant motive for which is pecuniary gain. It does not include a proposal or other writing prepared and delivered in response to a specific request of a prospective client. I’ve written about this 30-day rule often, first after Captain Chesley Sullenberger splash landed a plane in the Hudson, then after a plane crash in Buffalo. And most recently, I brought it up with this same firm, Proner & Proner, after another Metro-North derailment in Stamford Connecticut, when they apparently did the same thing they do today — use YouTube to solicit cases, despite our anti-solicitation rule. I counted stock videos uploaded in the hours after the accident, all of which have keyword loaded text to accompany it. See the screen grab above. This makes Proner & Proner the second firm to get dishonorable mention twice on this blog for the same infraction. (The first went to Ribbeck Law after plane crashes.) I’m willing to bet, given that Proner has over 1,000 YouTube videos, that this type of conduct is probably standard procedure for them. 2. They did notice but don’t actually care enough to do anything about it. I sure hope it is the former and not the latter, because the idea that the courts would institute ethics rules but not follow them isn’t a thought I like to contemplate. Since I happen to think that the 30-day rule works, I likewise think it’s important to enforce it. It’s also important to note, as I always do when taking a firm to task when my eyes see as ethical issues, that there are very few firms that do this. But those that do serve to influence how the public feels about lawyers. And when I go pick a jury on behalf of my own clients, my clients are the ones that suffer from the deep cynicism that such conduct creates. This is not just my opinion. It should be the obligation of attorneys to improve upon the system of justice, not bring it down. It’s like your mother told you: it just takes one bad apple to ruin it for the rest of us. Yeah. The NY Post will never miss an opportunity to gratuitously bash lawyers. It’s part of their DNA. the lawyer knows or reasonably should know that the physical, emotional or mental state of the person is such that the person could not exercise reasonable judgment in employing a lawyer. Written communications to a prospective client, other than a close friend, relative, former client or one whom the lawyer reasonably believes is a former client, for the purpose of obtaining professional employment shall be plainly marked “Advertisement” on the face of the envelope and on the top of each page of the written communication in type size no smaller than the largest type size used in the body of the letter. A lawyer shall not solicit professional employment as a private practitioner for the lawyer, a partner or associate through direct personal contact or through live telephone contact, with a non-lawyer who has not sought advice regarding employment of a lawyer. However, enforcement of the anti-solicitation rule has proven extremely difficult, especially in light of the reluctance of bar counsel to undertake sting investigations. When I was president of the State Bar of Georgia (2011-12), I appointed a committee that drafted tweaks of lawyer advertising rules (passed by the Board of Governors but still pending in our Supreme Court) and worked on getting into law enforcement, State Court solicitors and hospital attorney training programs units on how to develop sting investigations of “runner” solicitations. That remains a work in progress. Texas recently passed a tough barratry statute that may prove effective in dealing with runners and other improper solicitations. When there was a sugar plant explosion in Savannah a few years ago and out of state firms immediately began running ads directed at that specific incident, the general counsel of the Georgia Bar flew to Savannah and appeared on local TV news regarding the ethical concerns. So far as I know the firm running those ads did not get any case. Most of the families got legitimate, solid referrals to respected local lawyers.